FRANKFURT -- A Chrysler brand with more luxury than Cadillac. A Dodge brand known for driving dynamics. A Jeep lineup that is -- well, Jeep. And vehicles to cover every market segment so that wildly fluctuating fuel prices won't destroy sales. That's the rosy outline that's emerging as Chrysler Group and Fiat executives plot Chrysler Group's product portfolio. Chrysler Group's three brand chiefs are attempting to define clearer brand identities as they fit together a much broader product portfolio that will take advantage of platforms and powertrains from Fiat. Chrysler plans to go public with an outline of the product plan in November. The lineup seeks to reduce Chrysler's dependence on minivans and trucks. Given the volatility of fuel prices, "We're going to have to offer a broad array of products across every one of the segments," said Peter Fong, Chrysler brand CEO and head of sales for all the brands. He wants to take the Chrysler brand upscale, but he's considering a subcompact entry. Fiat S.p.A. and Chrysler Group CEO Sergio Marchionne reorganized Chrysler along brand lines after Chrysler emerged from Chapter 11 reorganization June 10. Fiat owns 20 percent of Chrysler. Michael Manley, CEO of the Jeep brand and head of product planning for all the brands, vowed that while Fiat technology and platforms will be part of the plan, "You won't see Fiat DNA in our brands." The three brand chiefs and other Chrysler executives are planning to separate Dodge from Chrysler more clearly and take Chrysler into a more luxurious position. Since the vast majority of Chrysler Group's sales are at stores that carry all three brands, the group can avoid similar offerings from two brands. The brand chiefs outlined their aspirations in an interview with Automotive News Europe sister publication Automotive News at the Frankfurt auto show. "We began analyzing the market and consumer trends in the U.S. and in Europe for the next decade to get the information to see where each of the brands should be," Manley said. He had the easiest job, he said, because "Jeep is Jeep." The Chrysler and Dodge brands required more work, in part because they share sister models, such as the almost identical Dodge Grand Caravan and Chrysler Town & Country minivans. By contrast, a single large-car platform provides an example of how Chrysler and Dodge can be distinctive while sharing. "The [Chrysler] 300 and the [Dodge] Charger share the same underpinnings, but they attract two different customers, so they are already in the right direction," said Michael Accavitti, Dodge CEO and head of marketing for all the brands. Accavitti said the Dodge brand needs to evolve, transforming the muscle-car spirit from brute force to driving dynamics. Dodge will go "from a middle linebacker to Lance Armstrong," he said. "We will remain a sporty brand, with a lot of emphasis on the performance area, but also on better fuel economy, benefiting from the great technologies Fiat is bringing to us," Accavitti said. Fong envisions the Chrysler brand as "a notch above Lincoln, a notch above Cadillac." This suggests a substantial change, because Chrysler vehicles generally sell for many thousands of dollars less than Cadillacs. "The [Chrysler] Sebring and the [Dodge] Avenger attract different customers, but their prices are too close to each other," Fong said. Accavitti and Fong vow to separate Chrysler and Dodge. "It is a dead process to have small differences which erode the brands," Accavitti said. "Today customers want a focused viewpoint. Our mission, consequently, is to separate and amplify what a brand is about." Manley's job at Jeep will focus more on fine-tuning than reinventing. The off-roading Wrangler will remain the image-maker, he said, although the brand is broad enough to continue include front-drive vehicles such as the Patriot or Compass crossovers. Until November, when the company reveals the product line, the brand CEOs are revealing little about specific vehicles. They did suggest that the minivan twins should be more sharply differentiated as the group strives to maintain its dominant position in the segment. 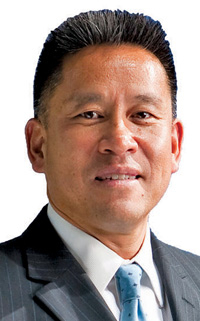 "Chrysler Group has 40 percent share in minivans, a segment we owned since we created it in 1983," Fong said. "Our target is winning customers away from Honda and Toyota rather then stealing them from our other brand."